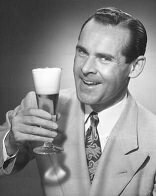 Thanks chaps, they are indeed made from guitar string with a disc of plastic attached to the end and slightly chamfered. A bit of dark wash helps take of the brightness. looks great. I got actual screws from a railroad supplier for my braces.What ever works. You are right, with the doors 81 L&R open, its hard to see any of that detail. Having started I might as well finish with this area, so on to the under-wing tanks. These often seem to have staining around the pylons, joins and seams with varying degrees of dirtiness - so there's lots of scope! Weathering was done in stages with panel line wash, some oil dotting (mainly browns), streaking then the odd patch of pigment to simulate dirt. I also used pigments to try and dull some of the rather bright stencils. Mostly there with these now. I might add some different pigment shades if I'm feeling brave however less is generally more so I might see how the rest of the weathering goes. I like the idea of tackling small items in stages as it allows you to concentrate on one thing rather than trying to resolve weathering the whole aircraft in one go. It also give you a bit of practise before the main event! Just catching up on this build, and it looks great! I love F4s, and this paint scheme is one of my favorites. Well done! 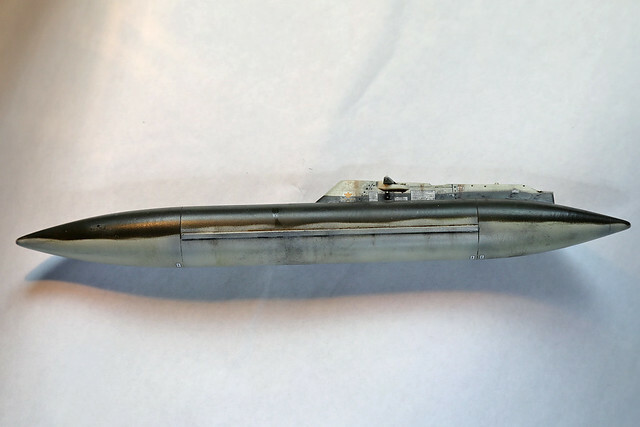 Continuing the weathering theme, I decided to move on to the under-fuselage and inner pylons. I used a medium gray panel line wash generally and a dark wash in any grates and grids before dirtying up a number of areas, but especially the engine areas. I've seen very few F-4s with clean undersides, except perhaps for special scheme birds, but didn't want to turn it into something that looked like it had landed wheels up in a farmers field - leave that to the armour dudes. It is therefore a relatively fine line between over and under doing it. What can be said though is that rarely does a plane look the same colour all over even if it is painted in the same FS paint. Natural light, wear and tear, and environmental conditions all make a difference to the final result and so unless you are making a portrait of a plane for a very discerning patron, it's all in the eye of the beholder! This is my convoluted way of saying I'll just make it up as I go along and hope it resembles something realistic at some point in time. 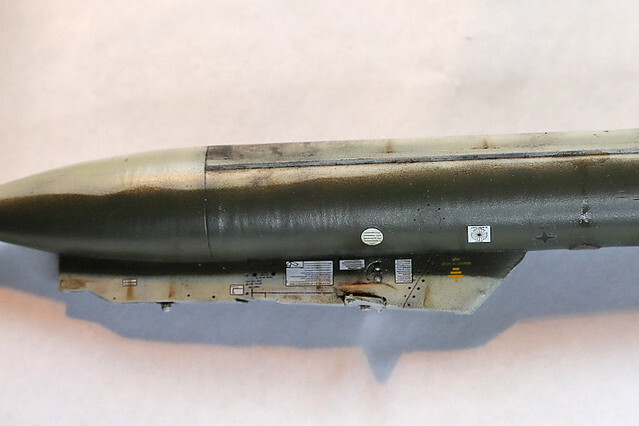 I used a brown exhaust wash to tone the rear fuselage and then added various grime and oil streaks. Hopefully it adds enough interest without looking like its just had a double engine failure (!) 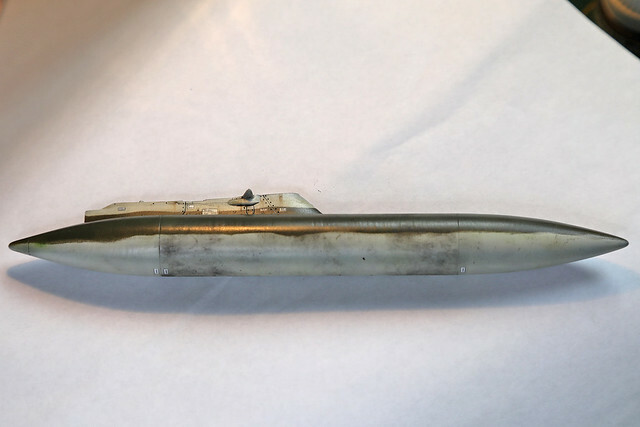 and I need a bit of contrast for the large central fuel tank. The pylons were treated the same with a PLW followed by some light streaking and a touch of pigments around the locking mechanisms. To make these pylons fit the jet I had to thin the sway braces and make room for the belly strap to pass under. 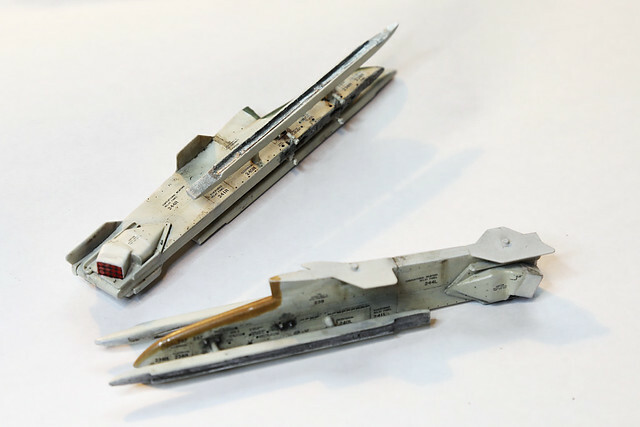 The chaff and flare dispensers have been added as the Revell kit just had the fairings. 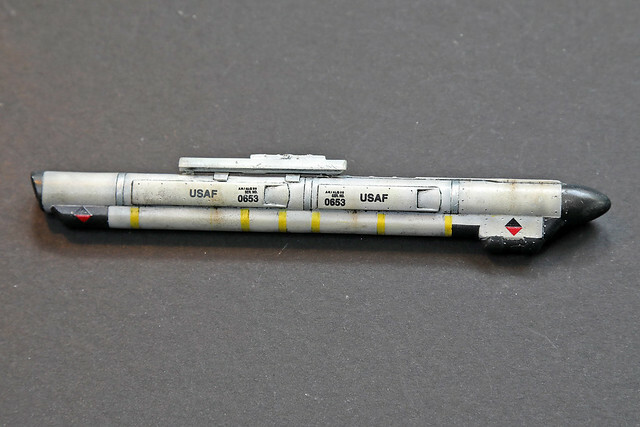 The rails were adapted from the Revell ones which were too long. They've also got some really small magnets in to allow the winders to be attached and detached at will. The winders also have magnets in but getting them all to line up and with the right polarity was a bit of a nightmare! 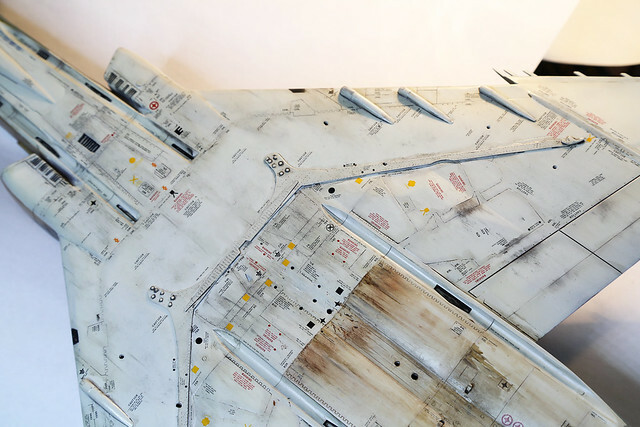 I also had to make sure that whatever weathering I did on the pylons matched in intensity, that on the undersides of the fuselage as they were rarely removed and would have weathered at the same rate. Next up - missiles! Probably my favorite fighter! I can almost see a flight of 4 "E" models in the arm/de arm area...those big J-79's rumbling and the crews with their hands on the canopy rails while the launch crew pulls the pins. Great work so far!!!! it's all in the eye of the beholder! This is my convoluted way of saying I'll just make it up as I go along and hope it resembles something realistic at some point in time. Awesoooooome! The Best F4` pylons! And the weathering underneath is so clean indeed, except for the few areas where it is quite heavier. I like that contrast, and how the decals are nicely contrasting too. Thanks chaps. A small benefit of not having a lot of time to do this stuff is that you have a lot of time to reflect on what you want it to look like and doing it in small steps allows a little more of the 'next-day viewpoint' to quell 'in-the-heat-of-the-moment' additions! I've never been a fan of clean jets and by that I mean with nothing hanging off them (though a clean, clean jet is probably my least favourite!). Something about a fully loaded jet that just means business. 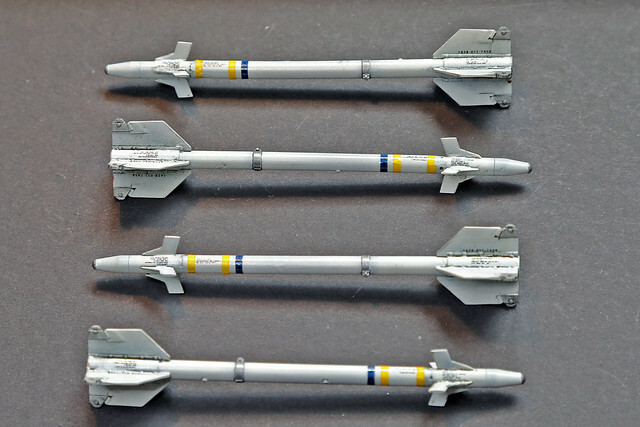 To that end the Revell F-4 provides you with 4 Aim-9s and 4 Aim-7s but they are not the right marks for the early years so it was off to the spares box to raid some Aim-7Es from a Tamiya kit and some cutting edge Aim-7Js as no-one seems to provide a correct plastic version. This seems odd as loads of cold war era pictures seem to have this type of winder and it was exported widely. The cutting edge resin pieces are very nice but very fiddly, especially the front fins where I had to guess where to place them. I also managed to lose one of the fins so had to fabricate another one from plastic card. As cutting edge don't provide you with decals I had to use Two Bobs missile sheet instead. These are great and add a nice touch of detail. I might add a little bit of weathering just to add interest but they were generally well looked after. 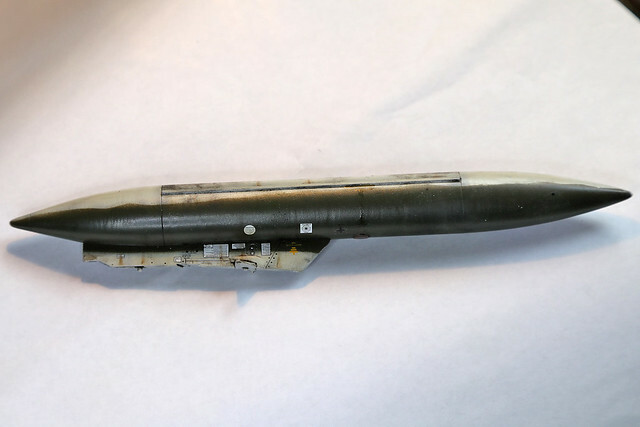 The Revell kit also comes with a jamming pod, an ALQ-119 I think, and since the front Sparrows will be removable I decided to paint this one up as an alternative fit. The piece looks reasonably accurate though the decals are a bit rough and ready. As they sit under the jet I dirtied it up a little more than the missiles. I hate to ask but have you been checking the lights as you go? With all that masking and painting it would be kind of hard. Good question Sgt, I have to say that I've sort of avoided that moment when you realise whether your homemade electronics have survived the build! Mostly because I'm trying to finish the model in a manner where the lighting is a nice addition not the end game otherwise it could feel like show's over when the switch is thrown and nothing happens. LEDs are pretty robust but my main fear is the soldered joints as its not my strong point (perhaps literally!). Not too far away now from the home truth. I could be wrong, but, I believe that the blue stripe you have on your Aim-9 missiles would indicate they are inert! I don't think you want that unless you are depicting a training mission load. A Beautifull Phantom Build Richie, the weathering is outstanding. Fantastic work!! I will be marking this as to come back and copy your techniques! Beautiful! !